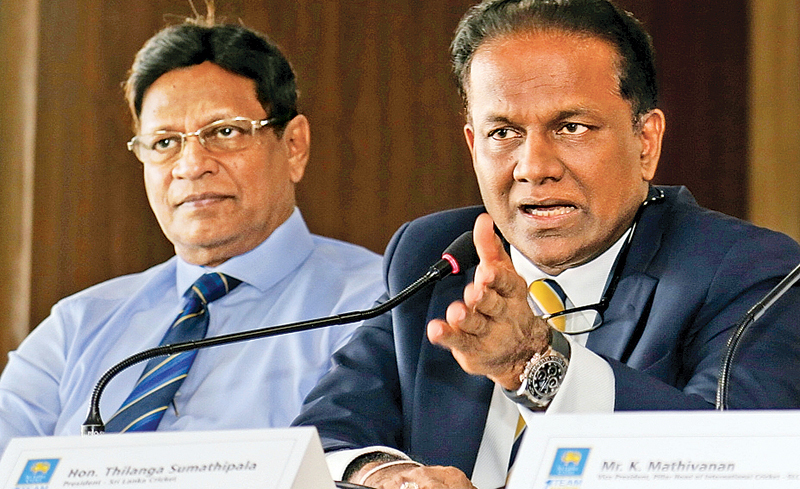 Outgoing president of Sri Lanka Cricket Thilanga Sumathipala stated that if an Interim Committee is appointed Sri Lanka Cricket (SLC) will lose lakhs of money (4.5 million USD) from International Cricket Council (ICC) grants at a press conference held at SLC headquarters yesterday. “We have informed of the current situation to the ICC. As our financial reports are not approved yet and if we fail to have our financial reports approved before June 30 we can’t get our financials grants. It will be suspended by the ICC. Sri Lanka will receive their grants within the next six month but if an interim committee is appointed they will not get it,” Sumathipala told reporters. “We have discussed this matter with the Minister of Sports Faiszer Mustapha and explained everything to him regarding the technical issues. Our first request is to hold a special general assembly and to hold the AGM according to the Sports Law. The second request is to appoint an electoral committee under technical changes and hold an election but when you go through this system it will take about 70 days to hold the election. We have the right according to the Sports Law as we were elected democratically,” explained Sumathipala.